Boys. I was blessed with four of them. They are all now in double digits, ranging from the just-turned-10-year-old to the still-16-year-old, and they are a handful at times. I've read more than my share of parenting types of books that are either about general parenting, or about parenting boys in particular. I've read a few books on praying for your kids. I'm not sure why this title got my attention. 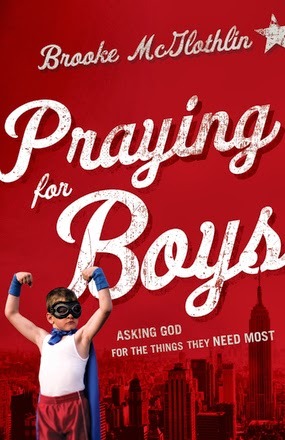 Praying for Boys. It's direct and to the point, and maybe that intrigued me. And it is written by Brooke McGlothlin, not that the name meant anything to me. However, she's a co-founder of The MOB Society, and that is something that got my attention. I've always been impressed with what I've seen there, especially since it seems like they live in the real world where boys make messes, exasperate their mothers, and the moms aren't perfect either. So, assuming this was going to be just another one of those books that makes me feel inadequate, I requested to review it. Surprise! Brooke doesn't make me feel like a spiritual failure. This is a no-nonsense book that doesn't patronize me, but actually encourages me. And that's just the chapters before you get to the prayer part of it. Brooke doesn't give any checklists of empty promises (do A, B, C and D and you are guaranteed to have a model-citizen son) and she does come across as real. The prayer part of it -- and I worried a lot about this based on other materials about praying for your kids -- is easy and straightforward and doesn't make me feel like I'm putting on airs or trying to be something I'm not. Great book. I'm seriously considering it as a baby shower gift for a couple new mamas that I know.